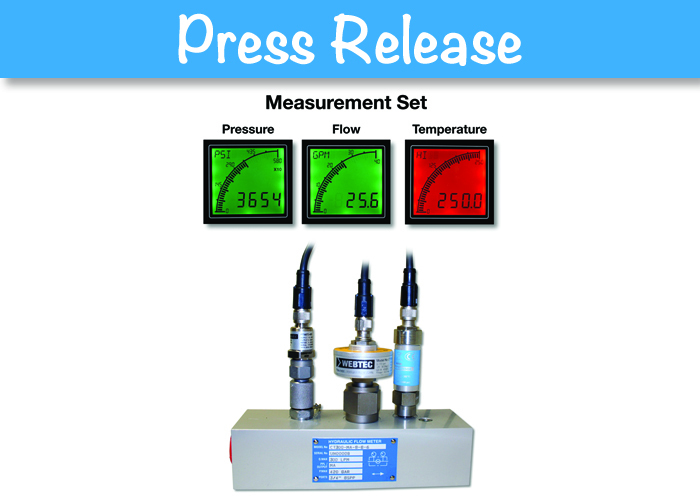 Whether you are a hydraulic distributor, repair centre or manufacturing company, there is now a new and simpler solution for measuring the hydraulic flow, pressure and temperature on your hydraulic test bench. Using Webtec’s extensive range of hydraulic flow meters, pressure transducers and temperature sensors, all with analogue output (4-20 mA or 5V) you can now configure a ‘measurement set’ to suit your exact needs. You can then install this ‘set’ inline in your system and when combined with a trio of the newly introduced low-cost pre-configured Webtec Advanced Panel Meters, your operators will quickly get to see exactly what’s really happening inside the hydraulic system. Furthermore, for condition monitoring applications each panel meter can be pre-set to ‘flash red’ or trigger an external switch if the measurement falls outside of an acceptable value. This is ideal for visual warning that your hydraulic system pressure is running too low, or oil temperature is running too hot or the flow to a critical component is falling below a minimum required amount. Webtec, the Milwaukee, WI based hydraulic measurement and control company, offers a wide range of hydraulic measurement solutions for use on mobile and industrial machinery with everything from simple displays and analogue output for use with PLCs through to portable and industrial data-logging solutions and custom CAN based sensors for OEM kits. For further information, please visit http://www.webtec.com/us/ or email sales-us@webtec.com .